Act# 54: Get rid of your check-list. For the longest time, my idea of the perfect man was this: He had to be at least 6 feet tall. Political, even if he was from the other political party, he needed to be passionate about it and able to articulate exactly why. He would have dark hair and eyes that contrasted with his olive-toned skin. He would have a fine palate, drink dark coffee, and have the ability to whip up beautiful, fresh gourmet dinners with little effort. He would watch indy films and sunrises with me. And have a wicked sense of humor...and style. He would read. Alot. And he would write about his world travels in his tattered, leather-bound journal. It didn't matter what he did for a living, but he would be fiercely passionate about his job. Oh, and he would be a bad, bad boy. With an edge and a hidden tattoo. He would always leave me wanting more. Now let me introduce you to my husband of almost six years. He really is 6 feet tall. And that would be the last of the qualities that I would be able to check off my list. He is a self-proclaimed Geek. For those of you who have no idea what that means, allow me to break things down for you: My husband likes Star Wars, subscribes to the science fiction book club, and yes, he plays video games. On our first movie date, he took me to the midnight showing of the King Kong remake. To celebrate his 34th birthday, we went to the San Diego Comic-Con. He's also the one who talked me into quitting my job last year to pursue "that which feeds my soul". The one who got on a plane with me (despite his fear of flying), 6 months after our first date to sit at my father's bedside when he was in a coma. And the one who came up with the idea to give our family Christmas shopping money to those who need it more than we do. I couldn't imagine how my life would have turned out if I had only stuck to my perfect man check list. If I had discounted my husband simply because I bought into the myth of 30 year old men, playing video games in dark corners of their parents' basements. In order for us to change the world and to challenge perceptions, might we begin by challenging our own pre-conceived notions about the perfect mate, about marriage, or about qualities that make someone a good partner? So for all of you out there who have a perfect man list similar to mine, let me offer you some insider's knowledge about why you might consider opening your heart up to a different kind of love potential. Please keep in mind that all Geeks, like all men, aren't created equal and this list by no means represents the vast variety of thought and perspective shared by self-proclaimed Geeks world-wide. Just the one that I live with. 1. They are wicked smart. Seriously, have you ever picked up one of those 500 page sci-fi novels? I have a few advanced degrees under my belt and let me tell you, they are way over my head. My husband can also perfectly articulate to our 5-year old son how band-width impacts the speed in which his Sponge Bob Youtube video loads, the science behind the eruption of volcanoes, and what makes a cumulus cloud a cumulus cloud. He can also talk to me for hours about feminist theory, gun control, economic privilege and other topics that turn a woman (like me) on immensely. Over the years I've heard other women complain about their husbands staying out a little too long at the bar, on the golf course, at the office. My husband can't wait to get home after 5 p.m. The only reason he even holds down his IT support job is so that he can spend his hard-earned money surrounding himself with all of life's comforts. A cozy home, the ability to sit down with his family every night for dinner.....in front of a 42-inch flat-screen with surround sound. You know, all those things that really matter. 3. They are great fathers. I'm an only child and playing with a kid doesn't come naturally for me. It really, really pushes my comfort zone to engage in imaginative play with plastic action figures or to dress up as a pirate and made to walk the plank. Fortunately for me, my husband is a pro at this and enjoys the process. Something about re-living his childhood. Father-son Star Wars battle = quiet writing time and a glass of wine for mommy. You see the beauty in this? 4. You will be at the cutting edge of technology. Want to start a blog? No worries. Download an e-book made for the Kindle on your iPad? You got it. Watch a documentary recorded from your satellite dish, two years ago, while you are 100 miles from your home, with no internet access? A piece of cake. 5. They are true to themselves. Most self-proclaimed Geeks that I've met are somewhat introverted and while my husband can charm dinner parties of 8 or less in our home (see #2), large formal obligatory parties make him squirm in his skin. To him, it's all about creating authentic relationships with people that matter. Or with the latest technological gadget. In all seriousness, he actually inspired me to slow down, to be more intentional about the people I surround myself with, and to invest time and energy only in the ones who add value to my life. So all you single people out there still looking for love, still carrying around your own perfect man check-list, that for some reason hasn't served you well over the last 10-20 years, for the love of God, give geeks a chance. 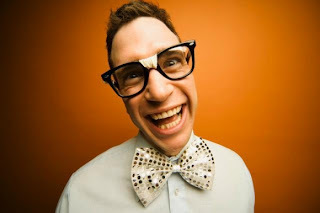 Oh, and my husband looks nothing like this Googled stock photo that came up when I typed in "Geek". And one more thing that I was actually able to check off my list: he always leaves me wanting more.